Mark your calendars for Sat. May 25th, 2019! The Barrie-Huronia Section's premier event is its annual Vintage Bike Swap Meet and Show and is again being held at the Huronia Airport, Tiny, ON. 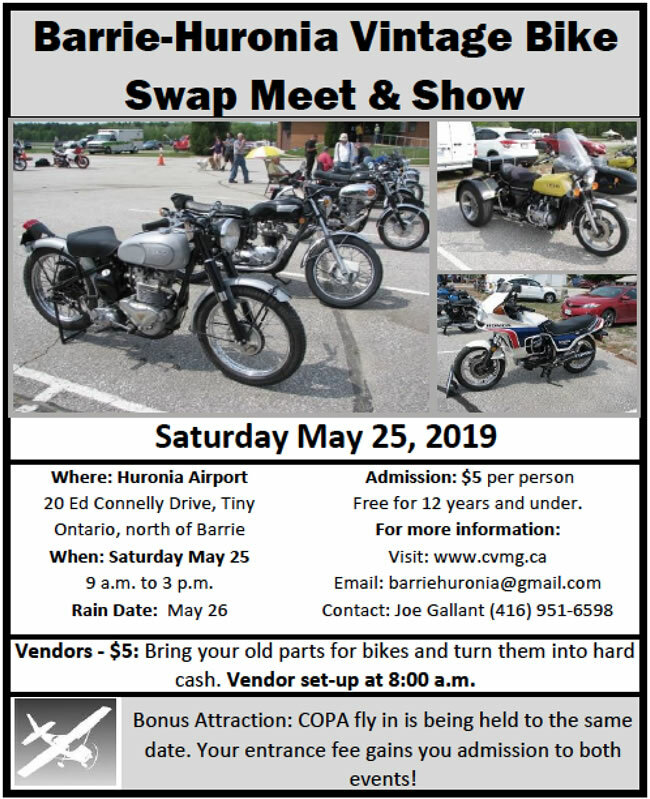 Following last year’s very successful show, this family event will again be held at the Huronia Regional Airport, a few minutes south-west of Midland, on May 25th. In addition to the dozens of vintage bikes on display and many vendors, our event is again co-ordinated with a Fly-In organized by COPA, the Canadian Owners and Pilots Association. Your admission to the Swap Meet also gains you access to the Fly-In so you can get up close and personal to the aircraft as well as the bikes. While at the Meet, stay for the lunch-time Ceremonial Bike Ride and be sure to cast your ballot for your favourite bike. The popular People's Choice awards give everyone a chance to vote and with cash prizes for the winning owners. A food truck will be on-site to satisfy your need for food and drink throughout the day. For more information, please email barriehuronia@gmail.com or contact Joe Gallant at 416-951-6598. Note to Vendors: Vendors pay only the regular admission price of $5. There is no extra charge for setting up your sales table. Bring your parts and bikes and turn them into hard cash!